Whether residential or commercial, need to have security parameters installed along their perimeters or boundaries. These security parameters come in the form of fences and gates. With gates being the point of entry and exit, due attention should be given to them when planning a property’s security parameters. Gates do not only provide security but also contribute to the overall aesthetic appeal. For many applications, installing an automated sliding gate is the popular choice. Here are the reasons why. Sliding gate are more secure. Sliding gate take up less space. Sliding gate enhance visual appeal and add value to your property. These gates are highly customisable and could easily accommodate most personal preferences. You get to decide the sliding gate’s size, material, and finish down towards its features, drive system, and safety devices. Since they are highly customisable, it can enhance your property’s exterior. Also, having this particular feature can easily boost your property’s market value and increases its appeal should you wish to sell in the future. 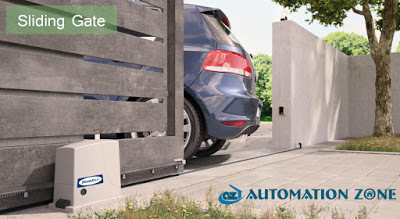 Automation Zone do not just sell gate systems. Our friendly staff members are equipped with knowledge to help you come up with the optimal gate solution for your property. They can answer any question you may have that will aid you in deciding on the best option for your properties. All our gate systems also come with professional installation to ensure you get both quality product and service.